DO YOU KNOW WHAT'S STANDING BETWEEN YOU AND SUCCESS IN LIFE? IT'S YOU! CHANGE YOUR MINDSET TO DEAL WITH YOUR FEARS AND YOU INCREASE YOUR CHANCES OF SUCCESS. Fear of failure, fear of public speaking, fear of being you, fear of asking for what you want, fear of saying NO and fear of change, the list is endless and yet we all have fears in both our personal and professional lives. 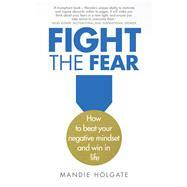 Fight the Fear will help you get the results you want by helping you to overcome your fears one step at a time. In short, easy-to-read, jargon-free chapters, you’ll discover proven strategies, skills and tools to help you deal with typical situations we all dread such as saying no, appearing confident without being arrogant, asking for what you want, public speaking and picking up the phone. Don't miss out on life's big opportunities, now you can manage your fear so it doesn't restrict you - there's nothing you can't handle. CHANGE THE WAY YOU BEHAVE EVERYDAY, YOUR THOUGHTS, YOUR BELIEFS, YOUR VALUES AND GAIN THE RESPECT YOU DESERVE. Mandie Holgate is a Business Coach, keynote speaker, author, broadcaster and trainer and Founder of The Business Woman’s Network. She teaches professionals, entrepreneurs and business owners the skills to create strategies that work. She has worked with clients from companies including Lloyd, Institute of Directors, Anglia Ruskin University, and many others she can’t name. She is also a Business Mentor and Coach and in the Growth Accelerator programme. Mandie is described by international speaker and Trainer Steve Clarke (Eureka Sales Ltd) as “Tigger on Redbull powered by Duracell”. And a corporate business woman described her as “The best speaker for business and success that she had ever heard. Male or female.” Woman’s Own Magazine named her one of their 2015 inspirational women of the year. Chapter 1. What if someone finds out who I really am?